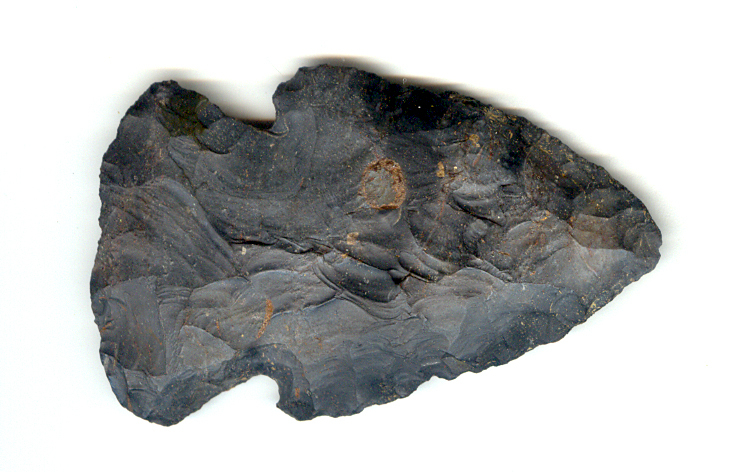 A Large Size, Heavily Used, Well Made, Hopewell Point That Exhibits Surface Sheen & Stone Aging Coloration Patina,Aging In The Corner Notches, Correct Late Style Flaking, Correct Blade Sharpening Reduction, Mineral Deposits, Polished Blade Use Wear, Correct Type Material & Manufacture For The Area Found. Ex-Gary Noel And Jim Bennett Collections. Several Blade Sharpening Has Reduced The Length And Width Considerably. This Is A Highly Collectable Example, Displaying Use! Includes Jerry Dickey And Ken Partain Certificates Of Authenticity!